Boeing will use a Delta 2 7320-10 to launch the the QuickBird satellite. Boeing manufactures Delta rockets in Huntington Beach, Calif., with final assembly in Pueblo, Colo. 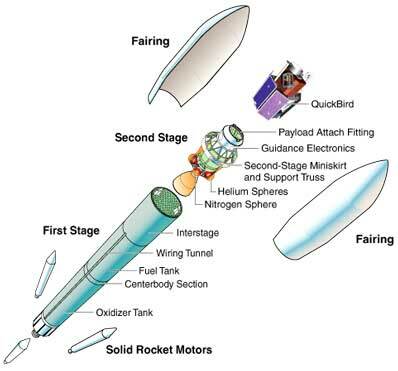 The 7320-10 two-stage launch vehicle has four major assemblies: the first stage, including main engine and three strap-on solid propellant rocket motors; interstage; second stage and 10-foot diameter composite payload fairing. The Delta 2 is approximately 126 feet tall and eight feet wide. The Boeing family of launch vehicles is derived from the Delta family of rockets built and launched since 1960. In that time 287 Deltas have been launched.